Somebody sent me this link to a story from a community kollel about several invasions by bats into frum homes. According to the story, these invasions were both interpreted and solved via the bat's passuk in Perek Shirah: Perek Shirah explains why the bat appeared in the houses at that time, and reciting the bat's passuk from Perek Shirah assisted in finding the bat in order to remove it. The irony is that the bat is not in Perek Shirah. The alleged "bat" in Perek Shirah, called retzifi in Hebrew, is not a bat. Now, at this point some people will be saying, "Well, this is just Natan Slifkin's opinion. Others are of the view that the bat is in Perek Shirah!" But this is where it gets really ironic. The basis for people claiming that the bat is the retzifi of Perek Shirah, is the ArtScroll edition of Perek Shirah. And the ArtScroll Perek Shirah got it from me (as they acknowledge in a footnote). And I was completely mistaken about it! When I found out that ArtScroll was working on Perek Shirah, and making use of my book Nature's Song, I wrote to them to inform them of a mistake that I had made in my book. My identification of the retzifi as the bat was a total stab in the dark. I claimed weak support from a commentary called Pi Eliyahu who identifies it as the tinshames, which in the Chumash is identified by some as the bat. But this is in fact no support at all, because Pi Eliyahu understands tinshames to be the owl. I only chose the bat because, faced with no evidence whatsoever (at the time) as to what the retzifi really is, I chose an animal that at least, with a generous dose of creativity, matches the theme of the passuk in Perek Shirah as explained by some of the commentaries. But there is no reason to think that the author of Perek Shirah was referring to the bat - and if he wanted to refer to the bat, he would surely have referred to it by the name atalef. By the time I published the second edition of Nature's Song, in 2009, I had discovered that the retzifi is probably a type of dove, and corrected my book accordingly. But it was too late. ArtScroll had not taken note of my email to them admitting error, and had translated retzifi as the bat, crediting me in the footnote. And people at large, in the explosion of interest in Perek Shirah, had adopted the ArtScroll view. And, of course, nobody is going to admit to having based their mystical interpretation of an event on something said by Natan Slifkin - even if Natan Slifkin is admitting that he was mistaken! Thus, an error that is destined to be perpetuated for all eternity, and used to "discover" the mystical significance of contemporary events involving bats, and even to have metaphysical results of enabling people to find the bat, all stems from a mistake on my part! I don't know whether to be amused or depressed. I'm always very impressed when people find examples like this. It's essentially a disproof of the conception of mesorah being flawless. One of my rebbes would rant on and on about how the artscroll nusach ashkenaz wasn't really ashkenaz but full of nusach sfard "corruptions." That's Judaism for you these days. That's funny, that is. Especially since you're now a gawdless heretic whom the pious can't even talk to according to Artscroll's biggest customers. "How do we know it's a bat? We could tell you, but we'd have to put you in cherem." I can just see your critics saying: "Slifkin has gone batty." Thanks for an amusing post! It's fine that people are adopting the Artscroll bat identification, since gedolim like you don't make mistakes. Plus once the very fact that the identification entered the mesorah of Klal Yisrael shows that it must be true. Or perhaps your opinion is what creates the "metzius" and that is why the pasuk really works! I think the what happened was that once Artscroll paskened (even though it was in error), the metzuis changed - the ritzifi BECAME the bat, and thus everything makes sense. "But it was too late. ArtScroll had ignored my admission of error and had translated retzifi as the bat"
By using the word "ignored," it's hard to judge ArtScroll favorably. But can they be judged favorably? I guess they could have simply forgotten to follow up on my email. I emended the post accordingly. 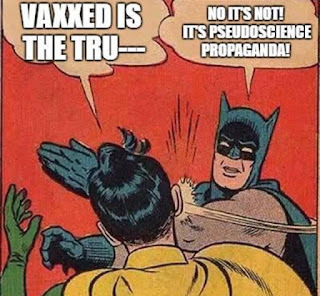 Unfortunately there is now a plague of rabies in bats in the US. 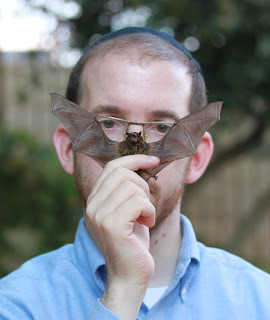 Does a bat have the halachic status as a sheretz, due to it's being related to mamalia sheratzim? If you touch a dead one woud one need to tovel in a mikvah? Or, since the Torah groups it with birds, it does not have that halachic status? Would it be too much to ask the segulah-mongers to do a randomized double-blind experiment with the special bat-removal prayer vs. some other prayer and pious vs. secular Jews as subjects? "If I was that Rav I'd be freaked out to know they were using my picture in such a way..."
You are referring to the Mouser Rebbe. A thousand years from now, your statement that it's a bat will be justified through your Ruach Hakodesh. My suggestion would be to choose humor over depression. They are both distracting, but humor is more fun. And there is value to fun. Compared to depression - humor and fun are emotionally and physically a lot healthier! Is anyone else disturbed by Rabbi Slifkin's admitted method of "scholarship" in this post? On the one hand it is obviously great to candidly admit when one is mistaken, how do we know that he isn't still employing such guesswork and passing it off as positive assertion? so what does one do with the example of "ashkenaz" in Torah? ok, we know that "ashkenaz" comes from the "north" somewhere, hence it being assigned to germany - far north-west of eretz yisrael. but what then happens when we discover that the *scythians* - directly north of israel *and* a lot closer - called *themselves* the "ashkuz"? (this is where we get the word "scuzzy" from, incidentally). it is hard to avoid the conclusion jumped to by text critics that the nun in "ashkenaz" in the Torah was simply a defectively written *vav* of "ashkuz" that has simply been missed by the masoretes. should ashkenazis actually be called ashkuzis? i'm not too sure what one does here, other than claiming that "ashkenaz" are a different nation entirely from the "ashkuz" and that they have no connection. A friend of mine emailed me this story shortly after Tisha B'av and I found it bizarre that the author repeatedly refers to the bat as a "bird". While I understand that a the Torah classifies the bat as an "Auf", it seemed to me that any intelligent person in our day would have learned in grade school that the bat is a mammal. I couldn't figure out if was just ignorant of basic biology, or grasping on to some sort of irrational notion that a bat must be bird since the Torah groups the bat with other flying creatures under the category of animal commonly translated as "bird". I have a question you could title, "The Ostrich, the bat and the bird": If we say the Torah is not incorrect when it lists the bat among other birds because it refers to flying creatures, then how do we explain the inclusion of the ostrich in that list as it does not fly? In our present day symbolism, associating doves with peace and hope for the future, it makes sense to connect them with the pasuk "Nachamu, Nachamu...". However, what was your basis for concluding that the retzifi is a probably a type of dove? And, how would it differ from the yonah? First of all, in the ten years since I wrote the original edition of Perek Shirah, my standard of scholarship has evolved considerably! Second, I never "passed off a guess as a positive assertion" - even ten years ago, I wrote a very lengthy explanation of why there is no clear evidence as to the identity of the retzifi, and explained that the bat was a tentative suggestion offered in order to give a meaningful explanation of the passuk. If Rabbi Slifkin paskened the bat into existence, surely he can pasken the bat back out of existence. To deny this is to be a kofer mamash. However, if the bat is female, we kindly request that you censor the image by blurring it as befitted ms hillary clinton and any other female mammals who we wish not to portray in printed media lest our eyes be led astray and catch rabies of the soul. This has to be the funniest thing I've heard in the last few days. This would be the funniest thing in the last week but chapter 74 of Harry Potter and the Methods of Rationality beats this by a small fraction. Do you mean to say that Artscroll was using your book without your knowledge? Was there some drama as to whether your name was mentioned or not? I thought it was taken out and then put back in. That really sealed the deal against Artscroll for me. There's no requirement for them to inform me that they are quoting my book. It's true about them printing an acknowledgement, taking it out during the ban, then putting it back in. But they made it up to me in other ways. What does "they made it up to me in other ways" mean ... ? regarding ostriches and bats, one could say that this is based on how people contemporary to the Torah would classify them, and עוף would encompass both bat and ostrich, for organic reasons. A bat because it flies and an ostrich for other bird-like attributes. "First of all, in the ten years since I wrote the original edition of Perek Shirah, my standard of scholarship has evolved considerably! Second, I never "passed off a guess as a positive assertion" - even ten years ago, I wrote a very lengthy explanation of why there is no clear evidence as to the identity of the retzifi, and explained that the bat was a tentative suggestion offered in order to give a meaningful explanation of the passuk. " Presumably? Where does the Chazon Ish say anything about Ruach HaKodesh? Rather, his view is consistent with himself. Only a small selection of the teshuvos ha-rambam were published centuries ago. In the 19th and 20th century hundreds, if not thousands, of additional teshuvos were published. It would be interesting to know if he made a distinction between the old, known teshuvos and the new ones or not, but be that as it may, his view is that we can't upset the halachic apple cart with "new" information that hasn't been chewed up and debated for centuries, and these teshuvos are new and not vetted over the ages. Actually, it's a concession on his part to even allow them any say. I guess that far, to banish the Rambam from having any say on his own views, he couldn't go. vahspuIf, per the Gemara, bats lay eggs, then one could well argue that not only are you the bat man, you are the egg man. Are you also the walrus? S.: Where does the Chazon Ish say anything about Ruach HaKodesh? "But they [artscroll] made it up to me in other ways." What's this? An 'official' organ of the charedim lent you legitimacy? And they suffered no backlash from their radicals? Who said that they suffered no backlash? I'm surprised and kind of dissapointed that you would have just given a "stab-in-the-dark" translation in your own work. The right thing to do would have been to say that you don't know what the "retzif" is and leave it at that. If you don't know, you don't know. No reason to pretend. Grow up, why don't you? They are a business, and must be careful not to leave themselves open to criticism to the radical fringe, who could cause them great harm. A wealth of diverse suggestions are tentatively offered by the various commentaries on Perek Shirah. (Confusion is compounded by the lack of clarity as to whether the retzifi and onchi are two different creatures, or two names for the same creature.) According to Birchas HaShir, onchi is the paliphan, a creature that can regenerate itself from any of its limbs if they are severed; alternatively, it is a type of living plant (intermediate between plant and animal, like an anemone) that lives in rivers. Yashir Moshe states that onchi is the “pelikan,” presumably referring to the pelican. According to Pi Eliyahu, the onchi is the bar yochni, a bird referred to as possessing extraordinary size (see Yoma 80a, Sukkah 5b, and Rashi ad loc. ); these descriptions may allude to a mystical concept (Mussaf Sefer Ha-Aruch), or they may be exaggerated, and it may refer to the ostrich (see Bechoros 57b and Rashi ad loc.). Tuv Ta’am, cited by Yashir Moshe, states that retzifi is a type of dove. Zimras Ha-Aretz VeHaShamayim states that retzifi refers to an embryonic bird of any species. The Kenaf Renanim, Tzitzel Kenafim, and Kol Rinah, all explain the retzifi and onchi to refer to a certain bird that hibernates during winter in clusters at the bottom of lakes. Kenaf Renanim states that it is called onchi due to a ring of golden (onech in Aramaic) feathers that encircles its neck, and it is called retzifi as it huddles in clusters, one resting against the next (ratzuf means “consecutive”). Tzitzel Kenafim explains that the name retzifi refers to it staying in the country year after year (consecutively), rather than leaving to warmer countries in the winter. Modern science has no evidence or theory to support the notion that birds spend winters at the bottom of lakes, despite popular belief during the Middle Ages in such a phenomenon. Aristotle was certain that swallows do this, but it appears that this myth developed from their habit of roosting in reeds at the water’s edge and of swooping low over the water to drink on the wing. The only bird that is known to hibernate at all is the poorwill (Phalaenoptilis nuttali), a native of the North West USA. However, it is difficult to identify this as the retzifi, as it does not exist in Europe or Asia, and it hibernates individually. Taking the essential concept of these commentaries that the retzifi/onchi is a flying creature that stays through winter and survives by hibernating in clusters, we have identified it as the bat. There is some support, albeit weak, for such an identification; B’shmi u’l’Kevodi Barasiv cites Pi Eliyahu that it is the tinshames, which is identified by others as the bat. However, perhaps it does not matter so much if the retzifi/onchi is indeed the bat; the point is that we can certainly learn the stated lessons from the bat. In the first edition of this book, rather than positively identify the retzifi, it was simply explained in reference to the bat, since the way in which several of the commentaries explained the verse in Perek Shirah matched the bat’s habits. It was also pointed out that Pi Eliyahu identifies the retzifi as the tinshames of Scripture, which is sometimes identified as a bat; however, Pi Eliyahu itself was explaining tinshames as a type of owl. The retzifi is clearly not the bat, which has its own name in Hebrew – atalef. It turns out that it is possible to identify the retzifi, at least broadly. Tuv Ta’am, cited by Yashir Moshe, and Perek B’Shir, state that retzifi is a type of dove. This identification is supported by early manuscripts of Perek Shirah, which state yutzfi or dayutzfi in place of retzifi. Since the letters resh and dales are often interchanged, we can understand how this name became corrupted to become retzifi. The datzifi is mentioned in the Talmud (Chullin 62a) as being similar to a turtledove. Furthermore, Rabbeinu Chananel to Shabbos 81a states that the tziltzela, a bird mentioned in Shabbos 80b, is a type of small dove also called ritzifi (although Otzar HaGeonim states that the tziltzela is a bird the size of a dove with small eggs). It is not possible to conclusively determine which species of dove it is, but we are tentatively identifying it as the laughing dove, which is similar to the turtledove but smaller, and to which we can match an interpretation of the verse that is attached to it. Rabbi Slifkin: In light of your response, I withdraw (and regret) my earlier comment. I was under the impression that you had simply translated it as "bat" and left it at that. "Hundreds (if not thousands)" of teshuvot haRambam have been published? I did not know this. Are these compiled into a sefer somewhere or otherwise available?